For the last few weeks, the oil icon on the dashboard of my car has been subtly reminding me that it is time to have my car serviced. Finally, I made the earliest morning appointment I could get to have my oil changed. As I sat in the waiting room flipping through old magazines, I came across an article in Time Magazine about the pace of life in America. The article referred to a 1968 expert testimony that was given to a Senate sub-committee on time management. The experts forecasted that advances in technology would radically change how many hours a week people would work. They predicted that the average American would be working 22 hours a week within 20 years. "The great challenge," one of the experts proclaimed, "will be figuring out what to do with all the excess time." As I sat there waiting for my car, I was hardly thinking that my biggest challenge that week would be to figure out what to do with all the excess time I would have that week. No, fifty years later we are hardly a nation of people who feel like we have too much time on our hands. Instead, we are a weary people. We are also a heavily burdened people. We are a people of constant worry. Much of this is due to the non-stop news feed of negativity around us. A few years ago, an interesting experiment was conducted. A large group of people recruited by a research center was told to record their internal dialogues by faithfully journaling for a full year. Their journaling was to begin each morning and included anything that came into their minds throughout the day. For example, if they watched the news, they were to write down whether the input from that show was positive or negative and how they evaluated the rest of their day as a result. After a year and a half, the results were analyzed. Not surprisingly, ninety percent of the time, it was found that people received negative input and in turn, the negativity caused them to feel overwhelmed, discouraged, and tired. We are also a tired people, both figuratively and literally. Even though in theory we have more devices that are supposed to make life easier, these devices are actually interrupting our rest and sleep. The lights from our smart phones, tablets, and computer screens are disrupting our sleep, because our bodies are literally wired to power down in the dark. Because we are lacking sleep which diminishes our energy, we depend on coffee, soda and energy drinks to get us through. Yes, we are a people who are weary, who are burdened, and who are very tired. Yet, we look for solutions in all the wrong places instead of looking to the One who created us and who knows us better than we know ourselves. Best-selling author, Harold Kushner, known primarily for his book Why Bad Things Happen to Good People, wrote another book entitled Who Needs God? in which he challenged us to be honest with ourselves about the ways we have dismissed our need for the power and help of God in our lives. "Atlas was condemned to carry the weight of the entire world on his shoulders. That was as harsh a punishment as the ancient Greek mind could conjure up. Today, it seems," says Kushner, "we have volunteered to play the role of Atlas. We have not offended God; we have dismissed God, told God we were grown up enough not to need God's help any more, and offered to carry the weight of the world upon our shoulders. The question is, when it gets too heavy for us, when there are questions too hard for human knowledge to answer and problems that take more time to solve than any of us have, will we be too proud to admit that we have made a mistake in wanting to carry this world alone?" The truth is there are times when the questions of this life are too hard and too complex for us to answer and comprehend. We were not created to solve all of life's mysteries. We were not meant to carry the weight of this world alone. Yet, we were created to entrust all of these things to God and trust in the rest and renewal that only God can provide. 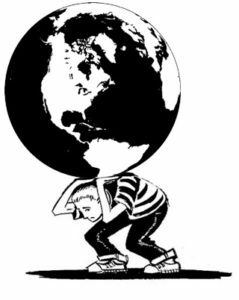 Jesus reminded us that God has not designed us to carry the weight and burdens of this world alone. He offers us freedom from our weariness, our burdens, and our tiredness. As he says to us, "Come to me, all you who are weary and burdened, and I will give you rest. Take my yoke upon you and learn from me, for I am gentle and humble in heart, and you will find rest for your souls. For my yoke is easy and my burden is light."